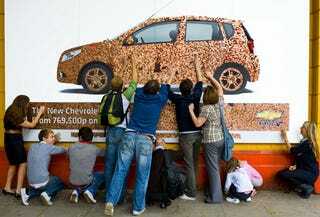 Chevy's UK arm commissioned this one-of-a-kind billboard made out of 20,000 one-pence coins (about $400). Though the Chevy Aveo's selling better stateside as of late due to the price-per-gallon of gas, it's become a little more popular in Europe thanks to billboards like this one as well as its Citroen destroying capabilities and giving them away to beauty pageant winners. But back to the ad at hand, how long did this clever billboard last?